Any informed person starting by President Obama, understands that a NATO escalation by means of arming Ukraine is equated with serious risk of a military response from Russia. My point being that a war-scenario of such dimension it has not been experienced since the missile crisis in Cuba in the sixties. Then, no one doubted that we were right in the brink of a war declaration, and nobody could exclude the possibility of a nuclear confrontation with the perspective of an holocaust. Could anyone argue that the situation, with reference to those respects above, is not even worse now, amidst this re-edition of the cold war where its new “epicentre is right on the Russian borders”? Why the eventual proximity of missiles in Cuba would be assessed as feasible risk for nuclear all-war but not the actual presence of NATO-assisted and armed troops, not in the proximity of Russia but on its very borders? Why did the world opinion, empathetical or not, understood President Kennedy when he issued the all-war warning to the Soviet Union because of the physical proximity of the “Russian threat”. And why would not foresee a similar stance by the president of a Russian nation beleaguered with NATO-armed troops on its actual borders? The most possible scenario in the aftermath of US providing lethal weapons to Ukraine: Russian will most predictably increase support to the revolutionary forces in Donbass. But after new “ATO contra-offensives” boosted by the new delivered “heavier lethal weapons” is to be expected incursions of Ukraine troops not only on the perimeter of Russia borders but also inside Russian territory – as it was essayed in lesser scale during 2014. What would Russia do then? what would any sovereign nation would do? 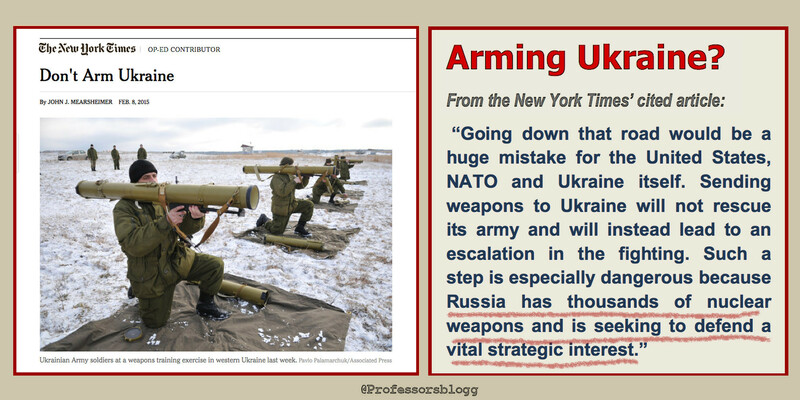 The article in the New York Times 9 Feb 2015 (shown in the first image above) highlights that the area in which NATO would be escalating the conflict is of outmost strategic importance for Russia. 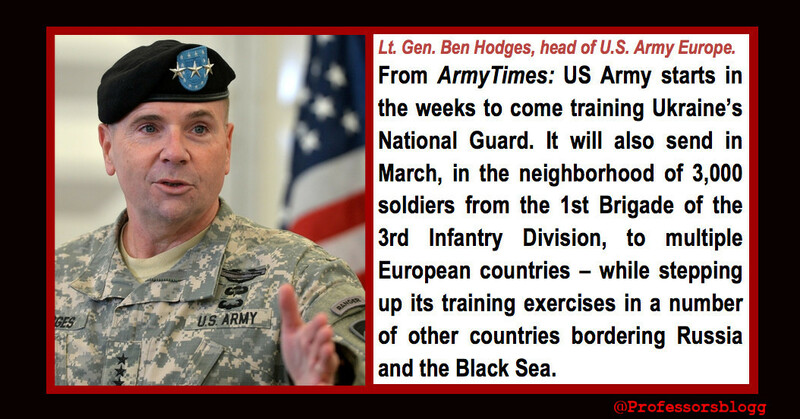 a) increasing of US and NATO troops in Europe – to be initiated during the next weeks – signifying a half-encircling of Russia; b) the economic sanctions; c) the (manipulated?) low-pricing of oil aimed partly to the detrimental of the Russian economy and the well being of its citizens, and partly to the political destabilization of the country. This last aim described by the Swedish Radio as a desired “system shift” (in plain words, the ousting of president Vladimir Putin). In fact, I have found the same term in analyses of the Russia situation in American media outlets traditionally associated with Pentagon hawks, such as Fox inc.
For my part, I have speculated in my blog and Twitter, that perhaps the Ukraine takeover by the fascist putsch of 2014 – which it was ostensibly initiated by design of the US embassy in Kiev – was a tactical step within a macro strategy aimed to the the political destabilization of the Russian political system and the replacement of the political elites in the fashion used in other countries of the neighbourhood. This goal would be only partly “geopolitical” – in the sense of expanding NATO revue. 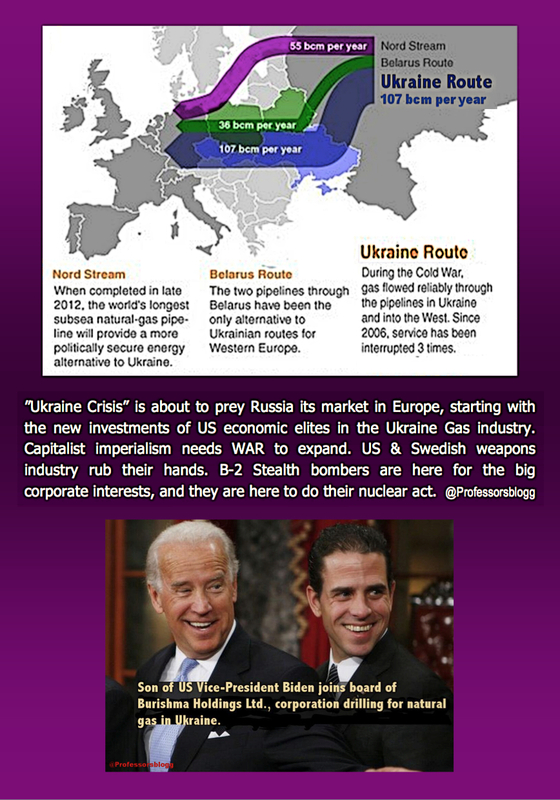 The US oligarchy has given clear demonstrations of the involvement of their own economic interest or personal gains – the pursuing to prey the Russian markets in Europe, starting in Ukraine. 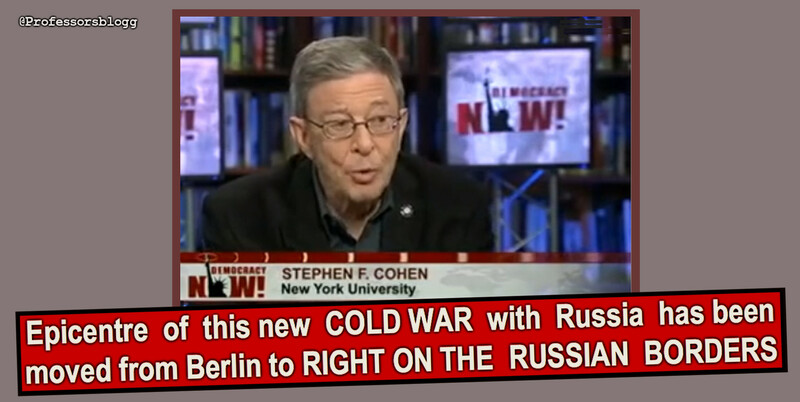 Professor Stephen F. Cohen from New York University has put it brilliantly. He concurs with Gorbachev on that NATO has started a new cold war with Russia, and he marks that the epicentre of this new cold war is not any longer Berlin, but it has moved by the US to the very frontiers of Russia. 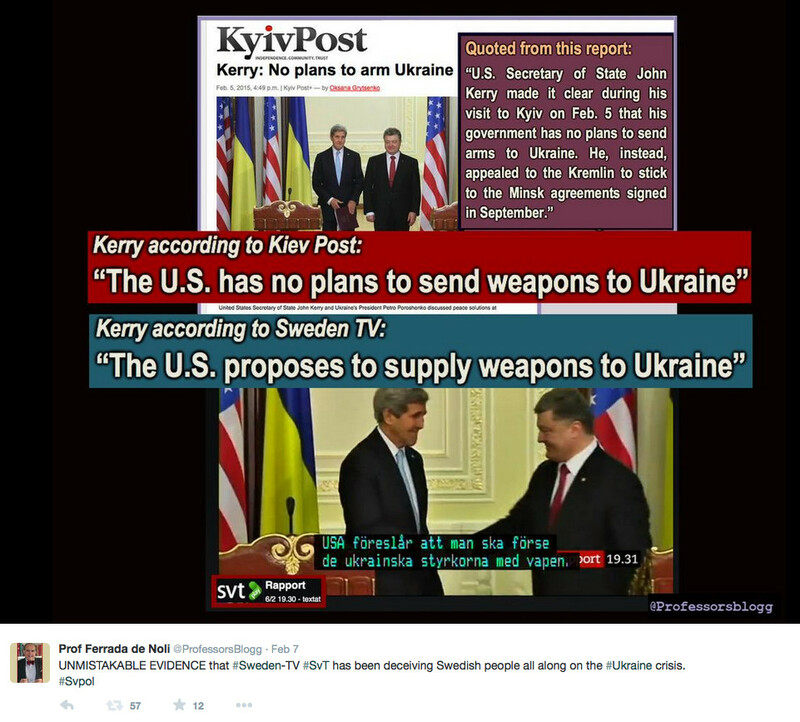 The Pentagon doctrine of “lethal weapons to Ukraine” includes “heavy weaponry” (see my Twitter January-timeline). Heavy weapons such as artillery etc. are in the to the highest degree offensive weapons that can be used in certain cases to defend positions. Not he other way around. One reason adduced for the “need of helping the defence of Ukraine” is precisely the acknowledgment of Poroshenko’s argument that Ukraine is not only under attack by “pro-Russian separatists”, but by very Russian troops which would have already invaded Ukraine. In other words, the war is with Russia. The Ukraine conflict has a documented record of incursions of Ukraine army units over the border with Russia, with killing of Russians inside Russian territory. Providing that army with “heavier lethal weapons” make Obama’s statement a practical joke. Would a further explanation be needed to understand the precarious of the situation? In Sweden, unfortunately, the level of harassment by the media against the Russian people, its culture and their elected leaders continues unabated both at state-owned public service outlets (Swedish TV and Radio) and ‘private’ main stream media (in fact, partly subsided by public funds). The Swedish public is swayed by misinformation on the Ukraine conflict by, most prominently, the Swedish TV (SvT) and Sweden’s main newspaper DN. Some examples of the Swedish MSM and “public service” TV and Radio anti-Russia are given in this separate article I published also today: “Sweden’s Russophobic press & TV lobbying for war“. This aggressive stance against Russia by a consortium of former Swedish government officials leaded by ex FM Carl Bildt and the State-owned Swedish TV and Radio, has not been only in a propaganda level, or initiatives at international forums such as EU. These provocations have taken the form of concrete military activities as the spying on Russia on US behalf. The above is difficult to explain against the backdrop of the poor military capability Sweden has in case it will have to stand a retaliation by Russia. 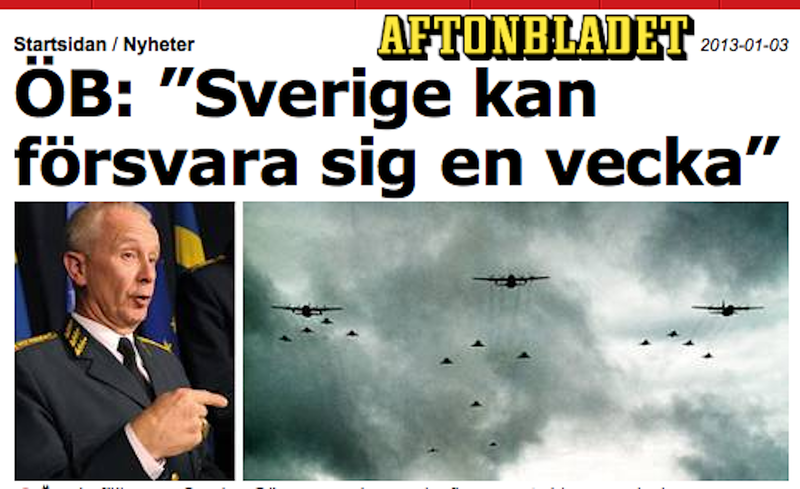 In the first place, the defence might of Sweden has been diagnosed by Swedens own Commander-in-chief of armed forces as practically non-existing. He declared, expressly, that Sweden would not be able to stand a defence of its territory for longer than a week, in case attacked. Secondly, Sweden oscillating stance on the issue of geopolitical alignment has taken the country from Neutrality during the cold war times, to dissembling its nuclear-protection structures in the aftermath of the Berlin Wall ending, marking the political disintegration of the Soviet union. No one really reflected on that Russia, in terms of military might, is a modern, bettered version of the Soviet Union that defeated the Nazis in WWII. But the most important in this context, on how dangerous it would be for Sweden in particular a escalation of the confrontation “West” VS. Russia is however the role assigned by NATO to Sweden (and Finland) in such potential war-scenario. This is a theme I am developing in the next article in this series. The focus of the coming analysis is thus the defence doctrine and foreign policy issues that has been prevalent in Sweden in the last years. It treats for instance the dangerous tipping towards NATO, the dissembling of Sweden’s territorial defence in profit of other government’s occupation wars in other territories, or the secret giving away of personal information of Swedish citizens to foreign powers. There I am also treating the issue of treason, of treason to the national interests of Sweden. Those things that in normal countries – in times of the war and the occupations they collaborated to bring about – politicians and journalists get not imprisoned in fancy petite rooms with TV and Internet, but hanged. And not just hanged but like impaled upside down, as Mussolini. Misschien dat de VS ooit inziet dat Europa geen kolonie is van de USA, maar waarschijnlijk komt mijn waarschuwing te laat, ik zie beren op de weg……. Ok, about NATO, but what about the Russian aggression towards the territorial integrity and sovereignty of Ukraine? Any one-sided explanation only gives part of the story. Can you please answer the question how to stop Russian aggression and how to give Crimea back to Ukraine? War never is a solution. Only the security industries of the US, the Russian Federation and European countries (Sweden!) want war. Yes, propaganda is galore. Maybe in Sweden -I would not know- but definitely in Russia. We only can counter this with non-partisan journalism. Being cyclopic in our attention leads to sidedness. I bet you can better, mr. Ferrada de Noli.